This is Ed Gray sitting in his studio in Mile End, beside the canal and next to the Ragged School Museum, where I visited him last week. 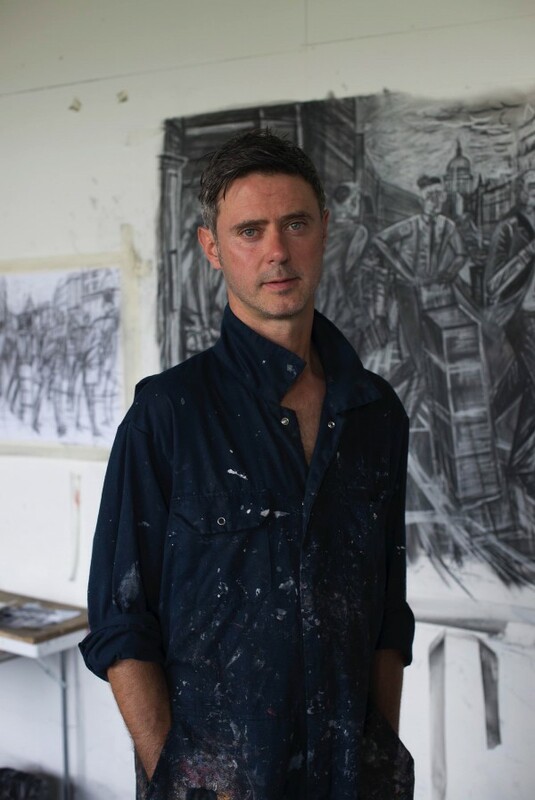 I found him in a large empty room with windows overlooking Mile End stadium and just three sketches on the wall for a street scene in the City of London which is his current work in progress. Ed’s visceral paintings capture the tumultuous street life of the capital superlatively, teeming with diverse characters and delighting in the multiple dramas of daily existence. Despite his mild manners, his is an epic, near-apocalyptic vision that glories in the endless struggle of humanity within the urban stew. Yet the overriding impression is not cynical but rather a life-affirming raucous celebration of the indefatigable vitality of Londoners. 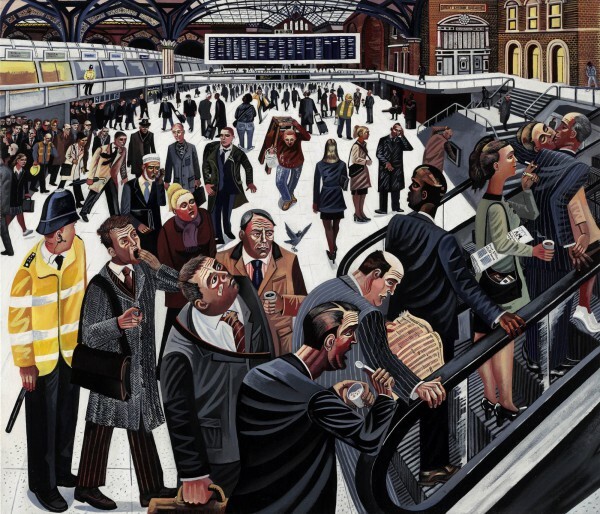 “I paint people and I make art about scenes of daily life. But I do not see this kind of picture represented very much in the contemporary art world. In their view, this work is not cool, happening or sensational. Yet I find so much stimulus when I go out onto the street drawing. I could make dozens of paintings about any single location. London is such a mixture of different places, there are different energies in every place, so I do not want to stay in one place, I keep moving on. 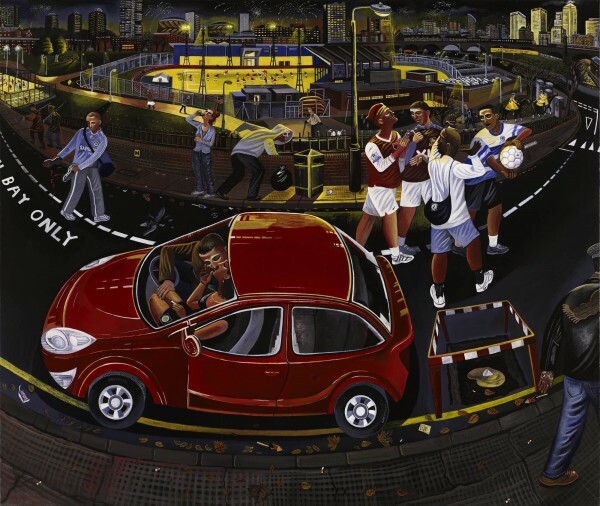 I have been painting a lot for the last twenty years, doing figurative scenes, and I work hard to have exhibitions and find an audience for my paintings, and provoke conversations about the city. It feels like an underground thing. My shows are popular and I am lucky because my paintings sell, so that keeps me going. It seems a shame that more artists do not go out and paint the people of the city. It is a challenge because the city changes so quickly. If I am working on a painting for three months in my studio and then I go back out into the city, it is different place. The place I painted has changed and the people have changed too. Sometimes buildings I painted are not there anymore, even in a short space of time. It is an incredible challenge and hard to know where to begin. I studied at art college in Wimbledon and then Cardiff, where I used to go down to the docks. It was before they regenerated them. I painted the docks and the buildings – landscapes without people. Then I got interested in the fish market in Cardiff and I painted the people there. On my mother’s side, my grandfather was a fish merchant in Grimsby so I had an interest in those scenes. It took off from there and I became more and more interested in painting people, which I had always done as a kid but I had not found the confidence to paint people the way that I wanted. It took that experience to put me on that path. 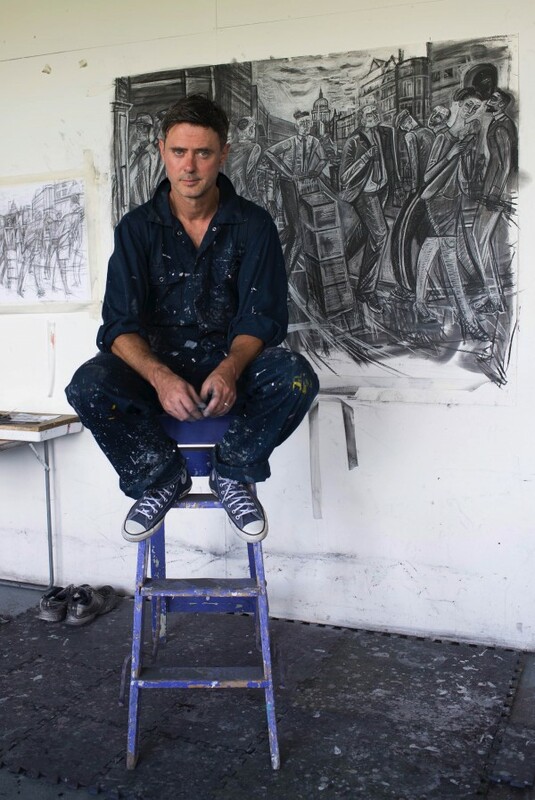 I left college in 1995 and moved back to London, and I had a studio in a squat in the Elephant & Castle. I was trying to paint big oil paintings seven foot across, but I had no money so I could not afford to do it. I lasted a few years doing odd jobs and trying to keep that going. Eventually I thought, ‘I can’t do this!’ so I took a full time job working as a security guard at the Natural History Museum. I thought I would go into some kind of educational work, I had been working in a youth club in Battersea and I knew I had something I could pass on to the kids. I liked making art with them. By then, I had found a way that I wanted to work, which was based in going to a location, making direct observations with my sketch book for however many days it takes until I have soaked up the scene, before going back to my bedroom and making a paintings over a period of weeks. These were much smaller than the work I am doing now but it was keeping me going, it was an outlet for all the things I wanted to say about the city. 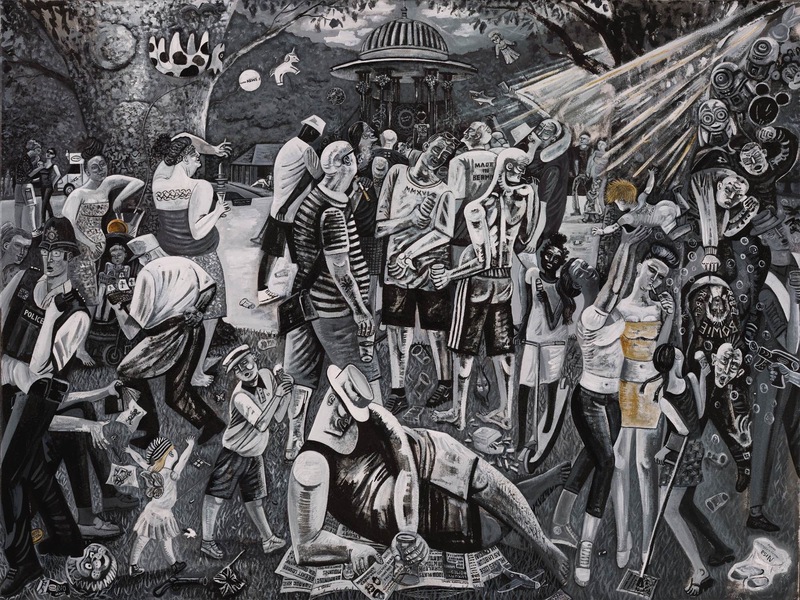 In the nineties, there was a negativity about the city and city life, but I had just come back from Cornwall and I thought it was the most exciting place, with so much to paint. I had all these paintings but I had no experience of galleries, so we took a car load of work around and the only place that would give me an exhibition was a little pop-up space in Brixton. I had my first solo show there in 2001 with ten paintings in it. It was amazing, loads of people came the private view and some could not even get into the building! It was real eye-opener to me that my painting was communicating something. All kinds of people came in from the street in Brixton, there was not a single demographic that came to see that show. It was a really exciting thing. I applied for a residency in Bermuda and I got it, so I took a sabbatical from my teaching job. I had some money because I had sold a couple of paintings from my show. I had a studio in Bermuda and I had three exhibitions out there. It was the first time I was able to think entirely about making art and not having to pay my rent. It was an incredible time and I can hardly believe it happened. Afterwards, I travelled from Panama to Mexico City, making paintings and drawings. I was learning about making work on the hoof. When I came back to London, I went back to the school and, after another year, I had another exhibition. 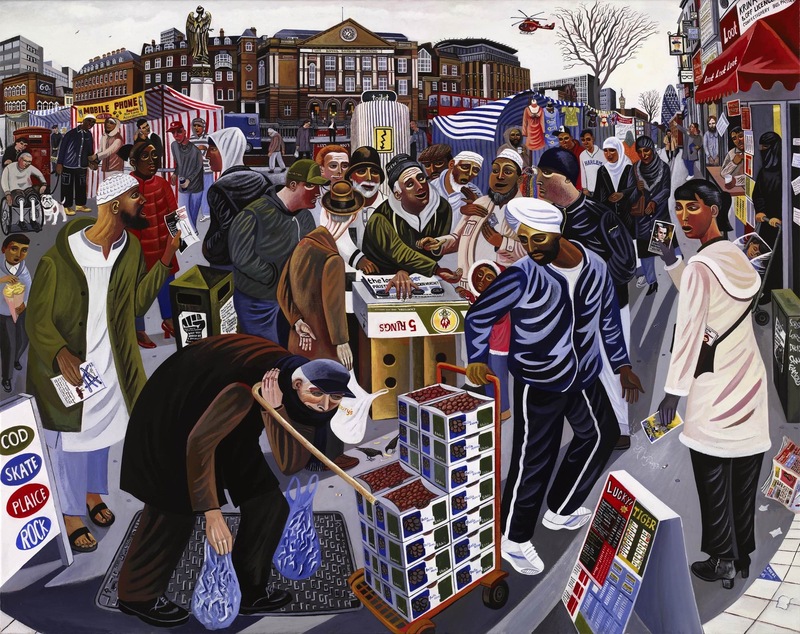 A gallery in Camberwell gave me a show in 2003. I did ten paintings and they all sold, so I left my teaching job and concentrated on painting. Acme offered me a studio in Mile End next to the canal in 2006. 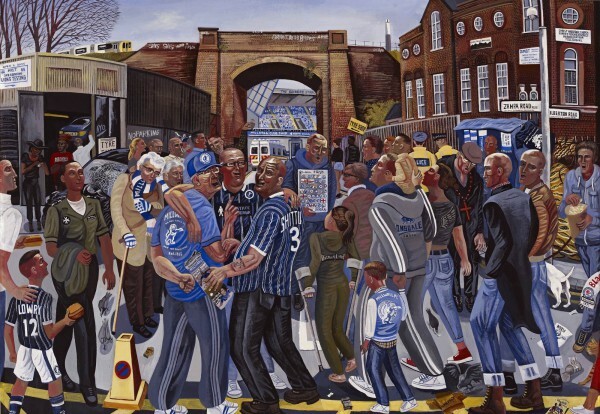 I have always lived south of the river, first in Bermondsey and now Rotherhithe, so I am very familiar with those scenes and I have painted some of them. But separating where I live and really work is really important to me, coming across the river. The amount of life and lives you encounter here is more diverse in the East End. There is so much I could paint. These pictures are full of vitality. The artist has such passion. Well, the contemporary art world may not like his work, but I do. I see a Stanley Spencer-ish quality to it (though obviously not derivative, and a much different, urban feel) that exudes life and movement. I like a lot of art that I’d never put on a wall, but I’d find space for some of this work. 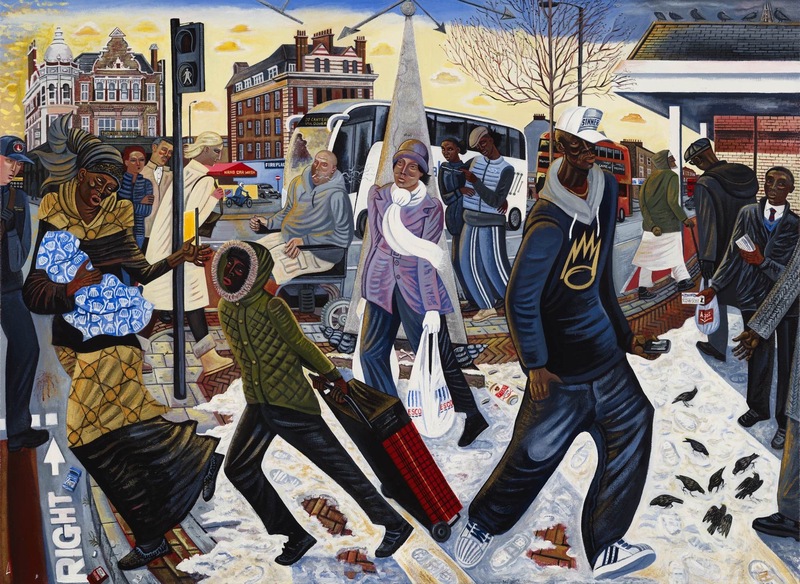 Looking at these wonderful, lively paintings and reading of the difficulties this thoughtful artist has overcome in order to create his art – and sell it – I’m reminded by contrast of something I saw recently in a glass fronted cabinet in the reception area of Hauser & Wirth’s gallery just outside Bruton in Somerset. A compressed sphere of paper, it was labelled “Crumpled piece of A4 paper by Martin Creed. Price: £140″. Thanks Valerie-Jael, Poet John , Bob and Bailey. Very kind of you to say those things about my work. I’m working towards a show at St Martins in the Fields in March. I will write more about that on my website edgrayart.com later in the year. I’m hoping these big new charcoals I’m working on will be more evocative of this constantly changing city than ever. and hopefully there will be time for new paintings as well. I do love William Roberts yes Bob. Ha! John my eyes close if I smile. But I hope there is good humour in the details in the work if you look closely. Glitter amongst the grime. 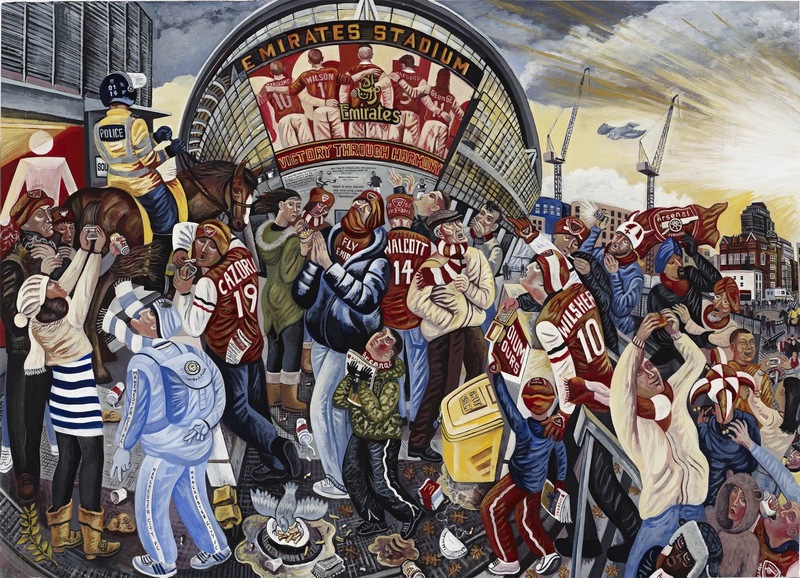 Ed Gray is an amazing painter who is truly empowered by London – a city he’s captured the essence of. His work may not be considered ‘cool’ by the art establishment but it will outlive the passing fads of the art commentariat and their aspirational hangers on. He’s a modern day Hogarth & has fought for the right to paint the city & people who are his inspiration. I would love to see his sketch books. Great photos of Ed by Sarah. Gosh… I was blown away by these paintings. I agree – very Stanley Spencerish in terms of the allegorical feel of them. They are incredibly strong and beautiful – and it’s wonderful to see familiar, urban places come alive through paint in such a magical and poetical way. 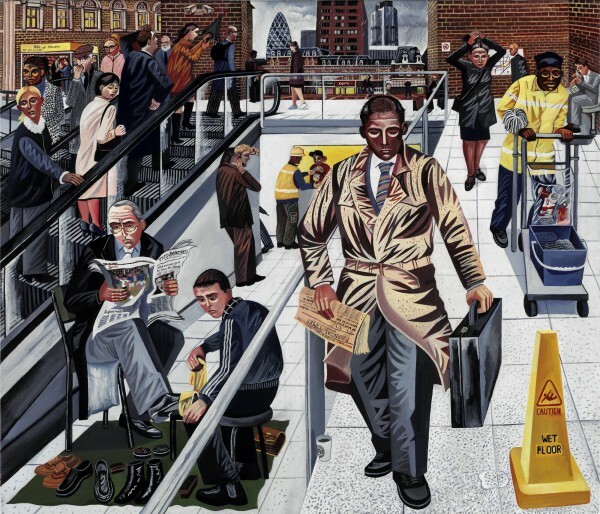 Would be very interested to see Ed’s exhibition in March. Top shelf stuff Mr Gray and I mean saloon bar not newsagents ! Thanks Phil and Rhianwen I really appreciate your eloquent words and I hope to see you at the show in March. 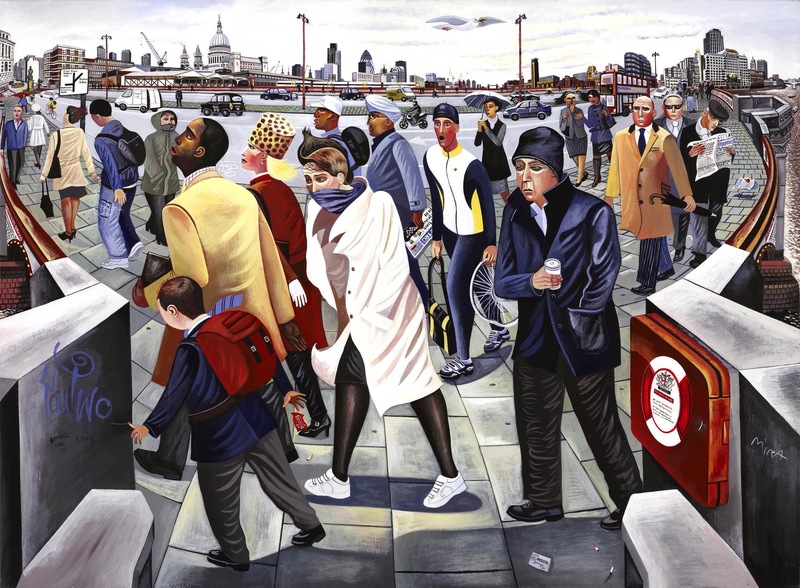 It gives me great joy that you recognise the city in this work. I often give talks about the stories in the paintings and I hope to do so at St Martin’s. Kosmo thanks that’s an honour. I know you are a good friend of Robert’s so it’s very nice to hear from you in person. This is beautiful work! I wish we had such a talent in Chicago. Best of luck to you. 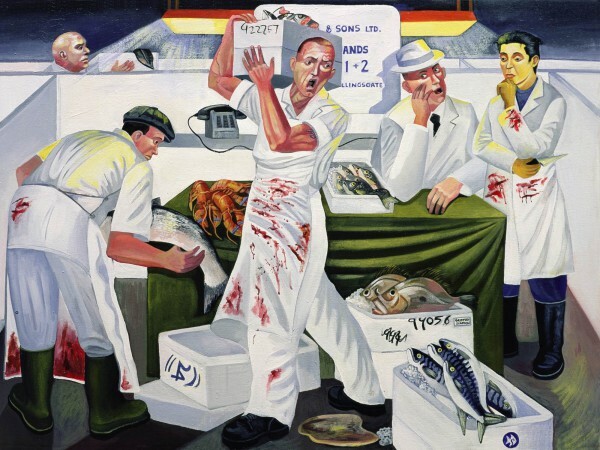 have a similar energy to American muralist Thomas Hart Benton. 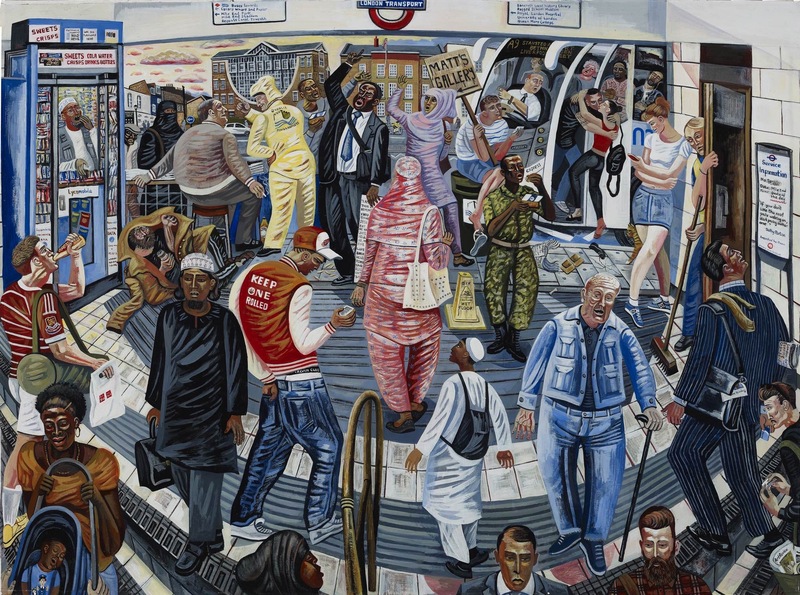 The way this fine artist represents the teeming vitality of groups of disparate people is not only inspiring — but timely. Totally compelling! Made my day. 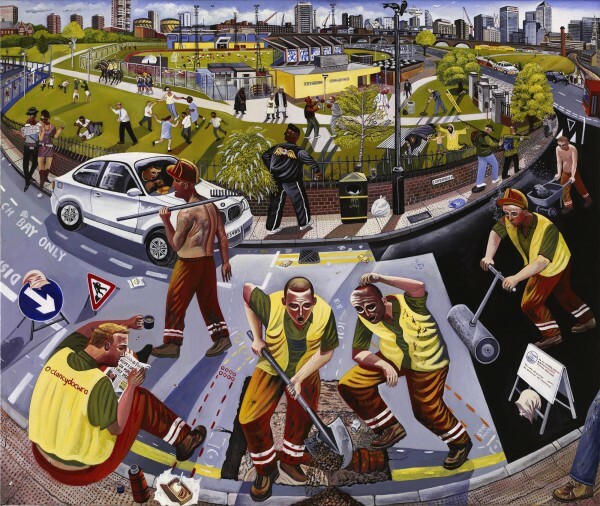 Brought to mind the working scenes of Lowry – in your response to your environs. 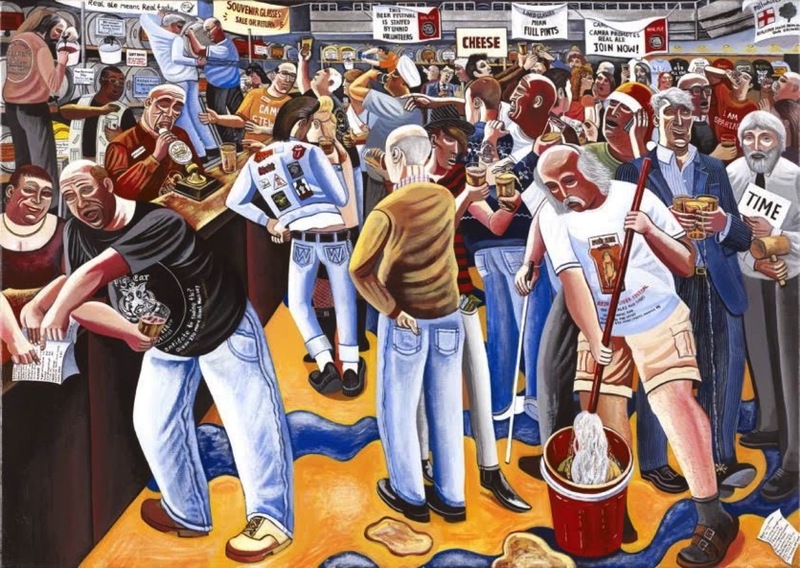 Interesting to learn about your fish roots at Grimsby – working ports and muddy river estuaries are a great pull, I grew up in Goole, on the Yorkshire Ouse. Good to know your work is in demand and causing a stir! Tremendous and magnificent work: epic in scope, and finely choreographed. Please do keep us posted about the exhibition; may we expect a book or catalogue? Thanks Judith in Chicago. I’d love to paint there one day. 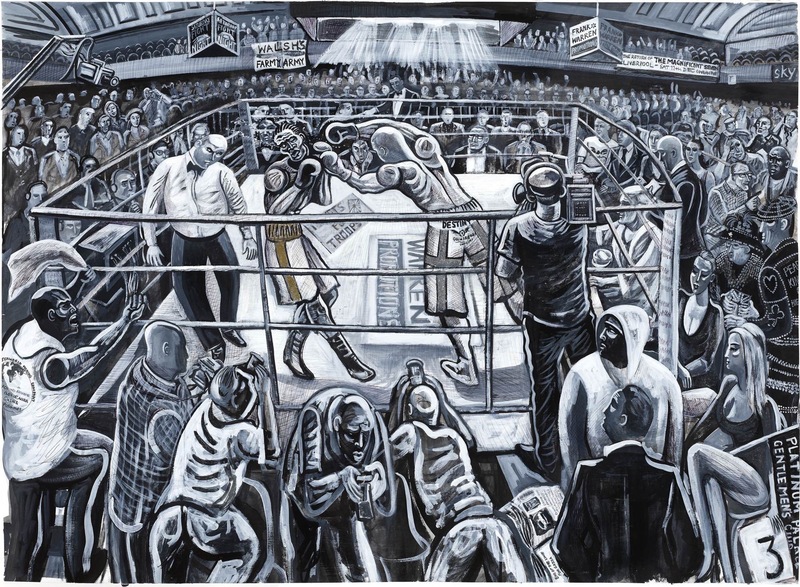 I love the ashcan school. And Archibald Motely Junior has been a big inspiration. Lynne many thanks. I’ve studied Thomas H B and I like his work a lot and I’m glad I made your day. Your enjoyment of these scenes is a great motivator. Enid, thank you yes Lowry is a constant presence in my mind. I had a good friend who met him and told me many stories. His was a lonely dedicated pursuit of his vision but I’m so glad he made that journey. I had a delivery job for a while and I once got to sit in the back of a van with a Lowry football scene. I was in awe. I’ve no family in the north now since my mum left for London in the 1950s but I do get to Yorkshire to walk the dales now and then. Nicholas, thank you so much, my gallery can organise a catalogue for you. Info@gxgallery.com 02077038396 It’s from 2014 and is entitled ‘Rock of Eye’. Chris, thank you. 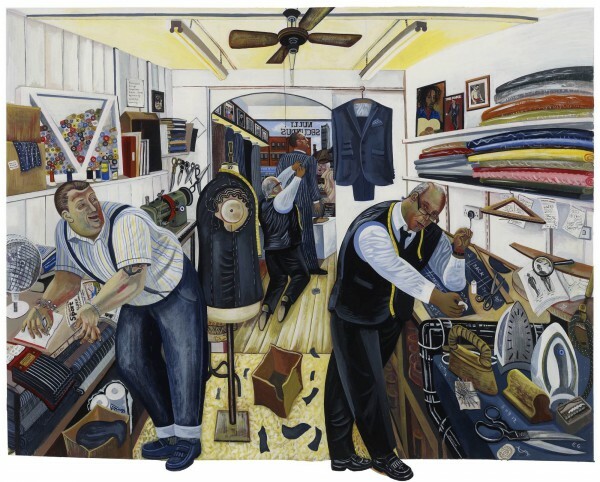 If you get the chance to visit George Dyer, Threadneedleman Tailors, in the Walworth Road he can make you a very fine suit and you can also see the original painting hanging in pride of place in his shop. I really like these paintings, especially the ones of the scenes in the City. Had the pleasure to meet mr.Gray in person the other week down the mayflower. He’s a painter that I really admire and respect. As an old punk I’m always looking for action and movement in any kind of art and Ed won’t let me down. I absolutely love Ed’s pictures – what an imagination, vision and incredible talent. 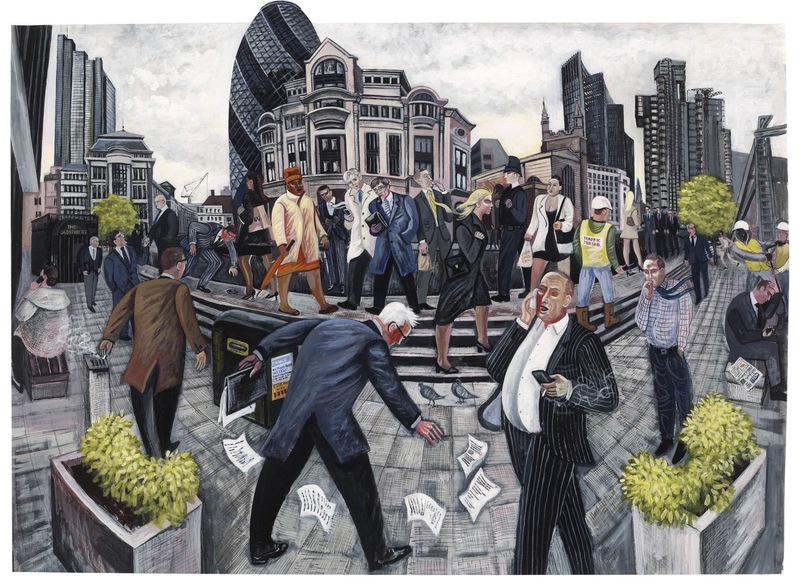 A group of us mature ladies who attend art classes and regularly visit The Mall Gallery then lunch at St. Martin’s in the Fields, just happened upon your artwork on display there and were blown away by your powerful, bold and exciting illustration of the chaotic energy of today’s London. Gave us a lot of pleasure and a lot to talk about. Is there somewhere we can go to see more of your work?